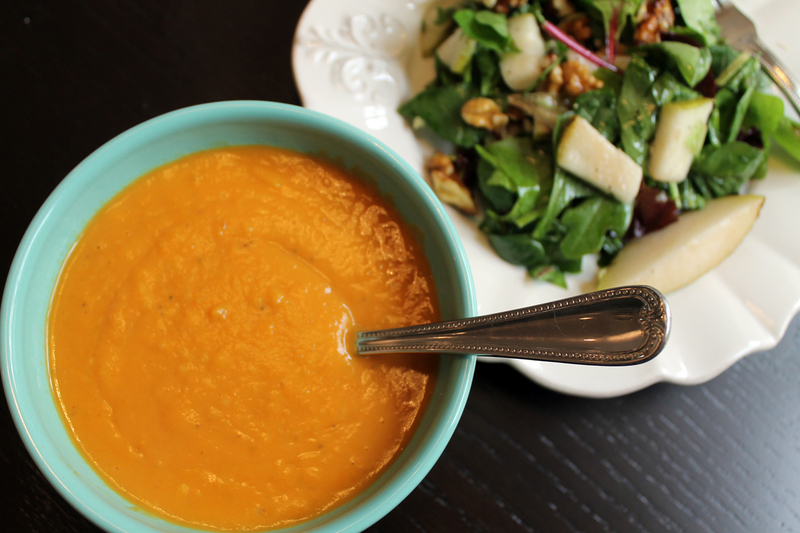 It may look like just soup… but this is so much more than that. 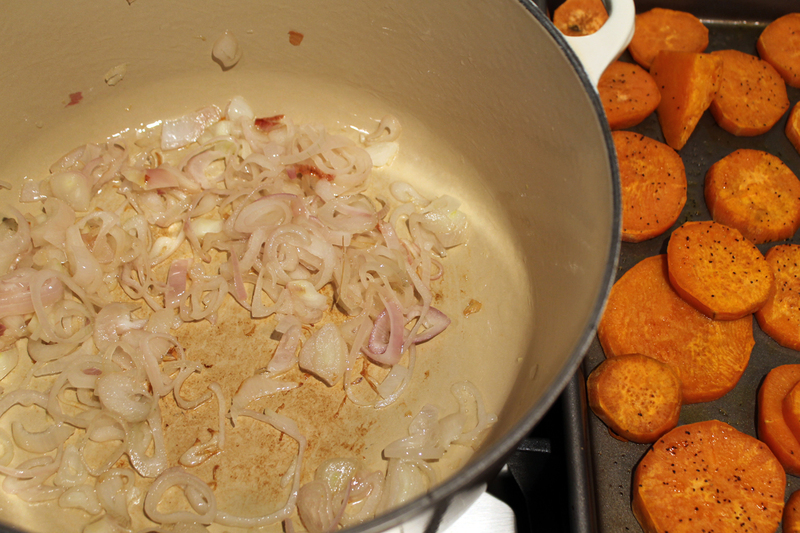 That little bowl right there is jam packed full of flu fighters – ginger, garlic, onion and sweet potato. We’ve been cramming these ingredients into alot of meals these days to help get us through the winter flu-free. So far it’s working (knock on wood). And with delicious finished products like this rich, creamy soup, getting that daily dose has been quite tasty, I must say. Ginger: Ginger is a root and has extremely strong anti-inflammatory, anti-oxident and anti-microbial properties. It’s long been a remedy to treat nausea and upset stomach (think gingerale on the airplane). Ginger is also an immune booster. Its heat drives circulation, warming the body and even causing a sweat to break. This helps to move colds and flus out of the body and leads to overall detoxification, which is necessary to maintain good health. Garlic & Onion: Garlic, onion and other white vegetables are the scrub brushes of the vegetable world. When consumed, they get in there and scrub away the stuff that our bodies need to get rid of – viruses, bacteria, parasites (ick). That pungent smell you get when you cut into them comes from sulfides, which give them their anti-viral and anti-bacterial properties among other health benefits. Sweet potato: Just like its orange-fleshy cousins, carrot and butternut squash, the sweet potato is oozing with vitamin A, vitamin C and manganese – critical components for immune support and function. What’s more, they taste like dessert – quite a delicious way to load up on the essentials. One more pro: curry, with its bitter and drying spices, helps to clear mucus and reduce inflammation as well. For centuries civilizations have used curry to flavor and to preserve their food. In fact the combination of ginger, garlic and turmeric is one of the oldest in the book dating all the way back to between 2500 and 2200 B.C. making curry possibly the oldest dish on the planet. Looks like those ancients were on to something…. Preheat oven to 425 degrees. Once you’ve chopped the sweet potatoes, spread them out on a baking sheet, then drizzle with a little olive and a few shakes of salt and pepper and toss. Bake for about 25-30 minutes or until the potatoes are browned. Heat a large pot over medium heat. Add olive oil. Then add shallots and cook for 2-3 minutes, until translucent. Next add the garlic and ginger and cook another minute or so. 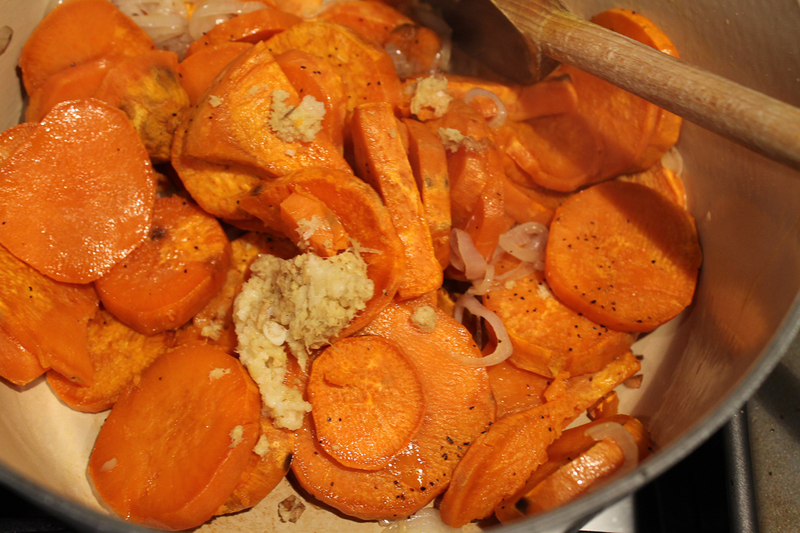 Then stir in the sweet potatoes and cook five minutes. Add chicken stock and bring to a boil. Lower heat and pour in coconut milk. Sprinkle in some salt, pepper and a little cayenne, if desired. Cover and simmer fifteen minutes. 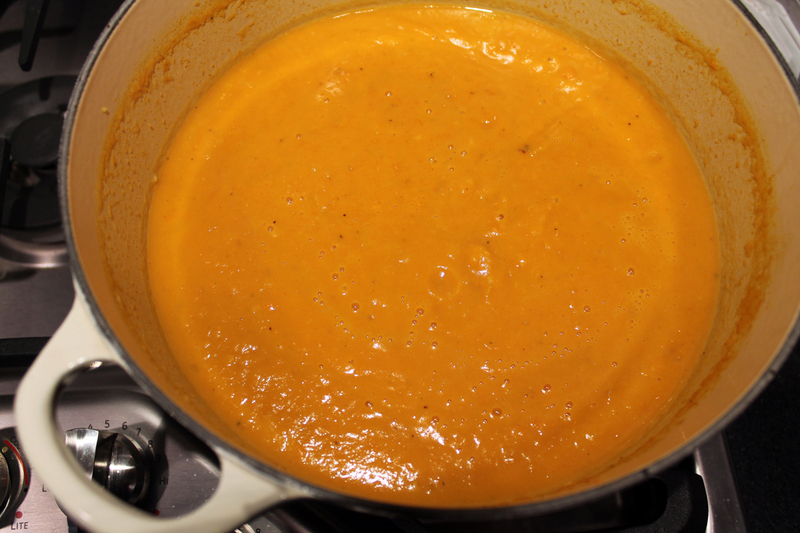 To blend the soup into a smooth, creamy consistency, you can use either a blender, food processor an immersion blender. If you’re using a blender or food processor the steam can create pressure and cause the lid to pop off. So take caution and blend in batches if necessary. That soup looks great and the colour makes me hungry! Just made it…it is sooooo delicious!!! Hi Megan – Thanks for the recipe! Just made it and it was delicious!! Hi Tanya! Thanks, so glad you liked it!